Every Great City has at least one Great restaurant and Belize is no exception. We have always admired and acknowledged these great restaurants worldwide and we do our best to ensure that Belize is represented. While at the Smoky Mermaid, you will be feasting on fine Local and International cuisine with the best Caribbean flavors! 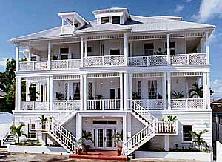 We are located at the Great House, an old colonial style guest house in the Fort Street Area in Belize. As you enter the doors on the bottom floor, you pass an array of offices and gift shops and enter the doors of The Smoky Mermaid. 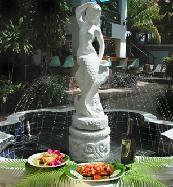 The Smoky Mermaid is located at The Great House, in the heart of Belize City; directly across the street from the Radisson Hotel and just minutes away from the Fort Street Tourism Village. Belize is known as the number one travel destination so make your trip complete by engaging in the utmost dining experience at the Smoky Mermaid Restaurant and Bar. There is never a dull moment at the Smoky Mermaid, and aside from delicious fine dining cuisine, you will enjoy yourselves beyond belief in this oasis in the heart of Belize City. Friends, Family and Fun. As our guests, you have the option to choose between our lush garden courtyard, private jungle decks, palapa dining, or an AC dining section for your ultimate dining experience. We also have a full service bar and bar deck dining available. Have a tropical drink at our Captains Bar and indulge in local snacks. Our Buddabar & Lounge offers serenity and comfort while lounging and watching the belly dancers on the big screen - weekends start Thursday's. 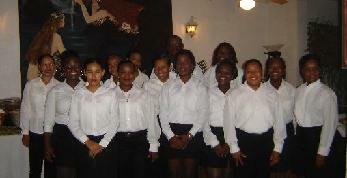 Our staff are on hand and ready to serve you!